Windy Gale sent us this article which was originally written by RCMP Veteran Henry Vernon Joseph LaCHANCE (Reg.#9245) and appeared in the 16th edition (1935) of the Vancouver Division’s Scarlet & Gold Magazine. Noted articles was transcript for us by Windy Gale who resides in England and a long-time supporter of the Force. In the history of the Force the jewels of spectacular performance too often obscure the duller gold of routine accomplishment. Much has been written about the expedition of the North West Mounted Police across the prairies in 1874. And deservedly so. But comparatively little is known about the accomplishments of a small detached portion of the Force which made a trek from La Roche Percee to Edmonton at the same time, although it is, perhaps, safe to say that without the less glamorous march the trip to the Rockies and return might never have been made. When the Mounted Police left Dufferin in July it was the intention of Commissioner French to proceed to the Rockies, leave a small detachment of police there, after disposing of the outlaws reported to be infesting the neighbourhood, and then march north to Edmonton. At Edmonton one-half the Force was to be stationed, the remainder to continue on the last leg of the return trip to Fort Ellice, the site originally selected for the future headquarters but subsequently changed to Swan River. The delayed departure from Dufferin, due to the necessity for awaiting essential equipment, was the first threat to the itinerary as originally planned. The cumber some equipment and the slow-moving oxen made the rate of progress slow; the inability of the eastern horses to adapt themselves to the prairie grass, the appearance of illness in men and cattle further conspired to retard the advance. Before La Roche Percee had been reached, Commissioner French knew that drastic action would have to be taken if the round trip were to be completed before the early and severe western winter set in. The solution arrived at was to send as much of the supplies as could be spared and practically all the farm animals to Edmonton by the more direct, better-known and less hazardous route formed by the traders’ cart trails running from Fort Ellice to the north west. Illustration of NWMP’s “C” Troop pulling the 9-pounders during the 1874 March West (Source of photo – Ric Hall’s Photo Collection). Superintendent William Jarvis volunteered to take charge of the detached force with Inspector Severe Gagnon as second in command. Staff Sergeant Sam Steele and Sergeant Tom Labelle were the two senior non-commissioned officers who were to go along. The main column of the expedition had arrived at La Roche Percee on July 24th, a distance of 258 miles from Dufferin, but Inspector Jarvis’ command did not take off for Edmonton until Saturday, August 1st. The interval was spent in resting up the horses and cattle and dividing the stores and equipment. Inspector Gagnon seized the opportunity to visit the geological freak, which gave the stopping-place its name. 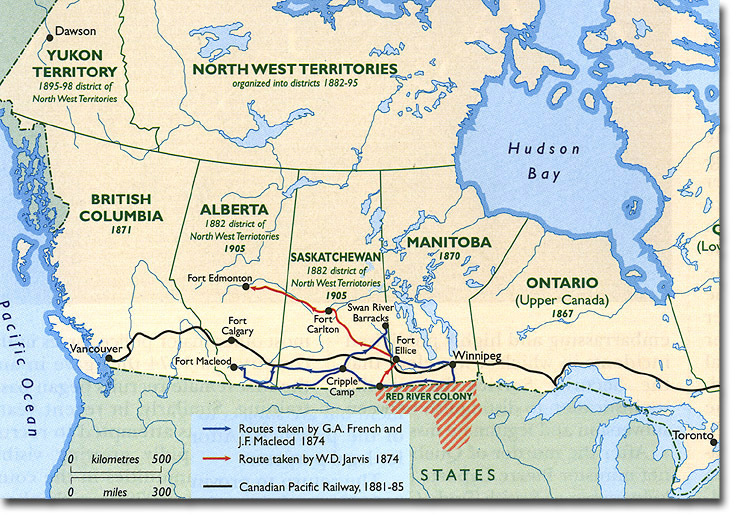 Map illustrating the march lead by NWMP Superintendent William Jarvis. Two other officers and seven constables who were to be stationed at Fort Ellice accompanied the party. Photograph of NWMP Superintendent Severe Gagnon (O.20). “They have taken all our horses from us,” he wrote, “the best in the Force.” And of the replacements:- “Nearly all are sick or the cast-offs of the other troops. One would laugh to see these poor skin-and-bone carcasses and the heavy loads we have. The shortage of men pressed all hands into service to keep the cattle from wandering. Even the officers had to assist. It’s amusing,” noted Inspector Gagnon. Violent rainstorms with an accompaniment of thunder and lighting made travel slow, miserable for the men and exhausting for the horses and cattle during the first four days. A party of Sioux Indians was seen to the right, following a parallel course to that of the police. That night the guard was doubled, and the men were cautioned to keep their firearms handy. The continuous rain made the trail into a morass and several wagons could not reach camp one night. It was necessary to call a day’s halt in order to retrieve the wagons and to give the horses a chance to recuperate their strength. The poor beasts could not go more than two hours without feed. Their strength was almost gone. Superintendent Jarvis thought, with a rueful smile, of the nearly nine hundred miles yet to go. August was at its hottest and a fresh start was made in the coolness of four-thirty in the morning of the 7th. The rest, seemingly, had greatly benefited the horses and only one wagon remained behind. A host of grasshoppers filled the heavens next day. They were as “thick as snow,”” wrote Inspector Gagnon. That night several wagons were again far behind and help had to be sent back after camp was made. Two horses had been abandoned along the trail. Eighteen miles had been covered that day. The next day, after a few hours’ early morning travel, another halt was called to rest the horses, although the oxen had been used to draw the wagons. Five sick horses became stuck in the mud of a creek and had to be dragged out by sheer manpower, and then propped on their feet. It took three more days to cover the few remaining miles to Fort Ellice. The settlement was unimpressive. Apart from the Hudson’s Bay Company buildings only a few Sioux, Salteaux and Cree wigwams were to be seen. A small detachment of Mounted Police was already there and it was the intention to build permanent police quarters on the north side of the Assiniboine, opposite the Hudson’s Bay Company’s post. Soon after the arrival of the Police the Indians were swarming about the new camp. “Some of the women,” wrote Inspector Gagnon, “are almost pretty.” Probably anticipating modern fashions “all the girls have their cheeks heavily painted in red, the men have their heads painted with the same colour.” The Indians appeared to be gay and sociable. Superintendent Jarvis decided to rest for several days. A man was sent back on the trail to bring in the two abandoned horses; he returned to report that both had died. Another horse had died on arrival at Fort Ellice, while several others were stuck in a river swamp and had to be rescued. The condition of the horses, wrote Inspector Gagnon, “is not very good,” but with his unfailing optimism he added, “however, some of them look better than when we left.” While at Fort Ellice the loads were completely overhauled and an inventory taken. During this period, particularly, the Quartermaster was not popular with his fellows. “He annoys us very much,” reads an entry in the diary. Nearly half the horses and three or four farm animals were left at the Fort, but four dogs were added to the caravan for good measure. The march was resumed on Tuesday, August 18th. The route led north of the Qu’Appelle River, following the course of the traders cart trails on the south side. The going was fairly easy for the first few days although the ox-drawn carts again began to lag behind. Game was plentiful and added a welcome variety to the table. Breakfast at Cut Arm Creek, the fourth day‘s camp, consisted of hot bread, butter, woodcock, prairie chicken, veal steak, bacon, good tea “and a good appetite.” It was more difficult to keep in touch with good drinking water, but a heavy rainfall proved a temporary solution of that difficulty. The first call on the medicine chest brought the unpleasant discovery that several bottles were cracked and broken. Once again the oxen and farm cattle took to wandering from camp, usually in the direction of the last stopping-place. This necessitated sending men back to locate the missing animals and delayed progress considerably. It was the Pheasant Hills district. In between the occasional summer storms the weather continued very warm. It was nearing the end of August, however, and the nights were becoming decidedly cooler. The campsite each night and the distance covered each day depended, to a great extent, on the proximity of water. Most of the lakes in the vicinity were saline. On August 25th Inspector Gagnon wrote, “I am tired, having ridden quite a lot to find water.” The same day the first visitor to the camp, since leaving Fort Ellice, arrived, in the person of the Reverend Mr. Maisonneuve. Suddenly the weather changed to rain and thick fog, which lasted for two days, varied only by heavy storms. The trail became so bad that a halt was called to save the horses, but the enforced rest provided an opportunity to lay in a supply of the ducks that abounded in the adjacent sloughs. One horse died. The party had now swung onto a more travelled trail and travellers were encountered more frequently. It was the Touchwood Hills district. The first day of September was ushered in with a cold rain that left everyone and everything cold and damp. Before leaving the wooded country for the bare prairies a supply of firewood was gathered. The next morning there was ice in the water pails. After covering twenty miles, about the best travelling done since leaving La Roche Percee, fresh water was encountered. The wild game continued to be abundant; two swans were seen, and, later, a herd of twenty kids. A strong wind was blowing but it failed to ripple the water in one lake passed. The men immediately named the phenomenon, “The Dead Sea.” The weather improved but scarcity of water again interrupted progress. Rolling country had now been entered, with brush covered hills never far distant. The Saskatchewan was crossed on the 8th of September. The half-breeds took over the carts but the entire day was required to get the cattle across and on the way to Fort Carleton. A terrific thunderstorm with spurts of hail and strong winds intensified the difficulties. The rain continued into the second day, becoming steadily colder. The carts were again sadly far behind, and a pair of oxen had wandered away. No one could cross the river. Fort Carleton was reached with the equipment on September 11th in a bitterly cold, driving wind. There was frost every night now, and the horses were suffering acutely from the change. The shelter of the Fort was welcome to all, and the spirits of the little band of police quickened. The ancient highway of the traders and trappers of the Northwest had been attained. From Fort Carleton to Edmonton was a beaten path, and, reasoned Superintendent Jarvis, to whom some of the territory was familiar, the difficulties of the trail could not be worse than those already encountered. But he knew that their charges were nearly at the end of their strength, with a distance of more than three hundred miles yet to cover. The shelter of the Fort had come too late for many of the horses that were dying, but a rest, good food and warmer weather might carry the others through. For two days it grew steadily colder, starting with a chilling rain and working up with a strong wind into snow. Finally the snow stopped, but the cold became even more penetrating. The horses drooped dejectedly in their stables. On the third day the half-breeds refused to continue the journey. This was the first let-down of the morale of the party; the first deviation from the keen but considerate discipline which had been enforced from the start. The patience and optimism of Jarvis and Gagnon had been a tonic to the men; the energy, resource and example of Steele and Labelle had been a stimulus to the efforts of all. And so they proved again. After considerable persuasion the half-breeds relented and consented to complete their undertaking. During this halt at Fort Carleton the horses were being fed with wheat, and a further supply had been sent for to the Mission at St. Laurent, fifty miles distant. It was hoped that the strengthening food and the week’s rest would keep the animals alive until Edmonton was reached. The crossing of the Saskatchewan with the weakened cattle and animals took four days, but then, as if to encourage the further efforts of the party, the weather turned clear and fine. The resulting cheerfulness was soon dissipated, however, when bad roads, mostly swamps, were encountered. On the second day out from Carleton one horse succumbed and had to be shot. The following day an ox had to be killed and another was abandoned in the hope that it would recover its strength and could later be retrieved. On the third day a horse and another ox were missing. Each day an increasing number of horses had to be lifted to their feet and urged on to further effort. Early in October stormy weather swooped down and resulted in the party taking the wrong trail. A day later, with the assistance of some men from Fort Pitt, a return to the Edmonton trail was made. The horses were finding it difficult to climb the hills, and one of them had to be abandoned. A sick ox was left behind. The travelling continued to be difficult. The route consisted mainly of bad trails, difficult creeks and hills, and the brief rests for the exhausted animals found the men working furiously making corduroy cover for mud holes and constructing bridges to permit the passage of the carts. But the weather was warm again, and flagging spirits took heart. On October 8th the cattle were too tired to go any farther and a short halt was called. A sick ox was entrusted to the care of a party proceeding toward Fort Pitt. The daily rate of progress was steadily dropping, and each night more ox-carts arrived at camp late. Another ox dropped dead. The cattle and horses unmistakably needed rest and better food, but the advancing season made delay impossible. And Edmonton was still more than a hundred miles distant. One bright spot arose when food for the horses, in the form of wild hay, was found. Victoria was reached on October 19th and, to the infinite relief of every man, arrangements were made to leave eleven oxen and all the farm cattle there for the winter. Three oxen had been abandoned the day before, two of them in a dying condition. The weather had again turned stormy, but a sudden change brought a return of fine, warm days. The ox-carts were increasingly late in arriving each night; the poor beasts drawing them being no longer equal to the effort. Each day found it more necessary for the men to supplement the efforts of the animals with their own strength. The Sturgeon River was too high to cross with the wagons and a ford had to be selected at the rapids one mile up the river. It had again turned cold and the icy water was almost too much for the horses, one of them dying on reaching the other side. It was the 27th of October, and unmistakable signs of winter were present in the cold nights, stormy weather and the appearance of snow. Two horses had to be abandoned and Eve others were left behind in charge of some of the men. Horse Hill was reached on the 28th with the horses barely able to keep erect, so stiffened were they that they could scarcely travel over the frozen ground. The last twenty-five miles were a nightmare to the men, who had to lift several of their feet every few yards. Coaxing, straining, urging, the gap finally closed in. It was nearing midnight when the first wagons reached Edmonton. The next morning a supply of barley was sent back for the rest of the convoy, but it was four days later, November 1st, before the last cart had been pulled into the Fort. 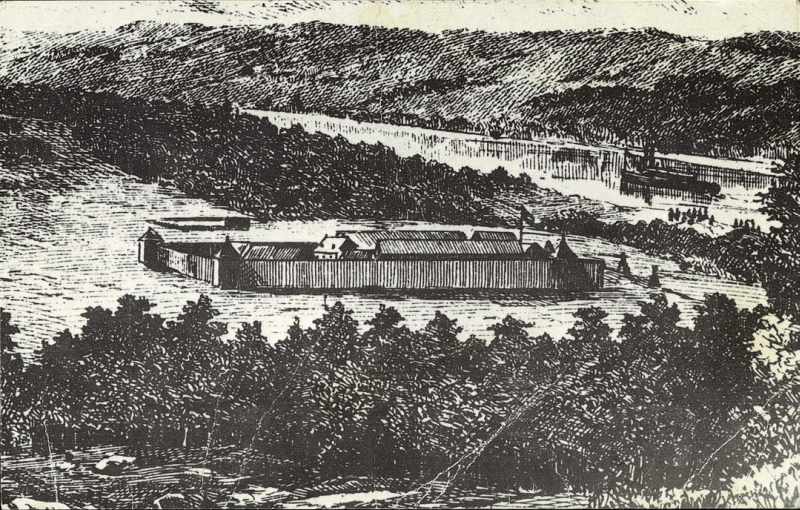 Old photograph of Fort Edmonton. The long journey was over. The objective, nine hundred miles distant from La Roche Percee, had been attained. Of the ten ox-drawn wagons which left Carleton, only four had arrived, the other oxen having died on the way. The difficulties of the journey may best be imagined by a comparison with the progress of the main column to the south. Almost at the same moment that the last carts were entering Fort Edmonton, Commissioner French with his staff and two divisions was entering the barracks at Swan River, having completed a round trip of nearly twelve hundred miles since leaving La Roche Percee. For, even with the advantage of the main column’s lightened loads after the Edmonton contingent took off, the Commissioner had been compelled to depart from his original plan and, abandoning the idea of reaching Edmonton, hurry back east to the new headquarters in a race against the encroaching winter. 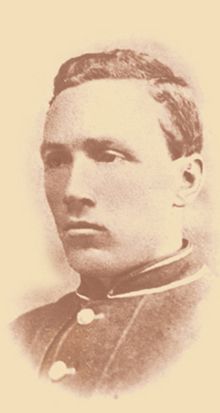 Photograph of a young NWMP Sam Steele.